Facebook, Twitter, and Tumblr have launched apps designed for Glass, Google announced Thursday at its I/O conference in San Francisco, during a session aimed at developers. With the Twitter Glass app, for instance, users can post photos to the site, and also see mentions, direct messages and tweets from people for whom the user has turned on notifications, Twitter said in a blog post. CNN and Evernote were also on the list of custom Glass apps. And Tumblr and Path are showing off experimental apps at their booths this week at Google I/O. The apps, which can be turned on through Google's MyGlass management app, are designed to help keep Glass wearers connected to their network of friends on those sites. With Tumblr's app, for instance, a Glass display can be used to scroll through a stream of activity on a user's Tumblr dashboard, which includes posts from friends, "likes," reblogs and new friend notifications. The Tumblr app is in a very early stage, but after being announced as a Glass partner app on Thursday, "we expect it to start blowing up now," said engineer Nick Thuesen. There currently isn't any discussion to incorporate ads into the app experience, Thuesen said. The social networking and blogging site rolled out sponsored posts roughly a year ago; ads came to mobile devices just last month. Meanwhile, Path, which is designed to be a more private social network by limiting each user's network to 150 friends, is exhibiting a similar Glass app at I/O. In its current form, that application delivers photo updates from friends and also place-based moments or check-ins, said Path engineer Nathan Folkman. Users can also tap their Glass device to leave "emotions" on posts such as love, smile, laugh, surprise and frown. More functionalities will be built into future versions of the app, which is currently in beta, Folkman said. "This project is at 20 percent right now," said Folkman, who built the Path Glass app. The two-and-a-half-year-old Path site is growing fast—last month it announced it had reached more than 10 million users. Besides Tumblr and Path, a separate group of developers are also showing off a social startup service for Glass at I/O called Ice Breaker. The app, which can be downloaded from the Ice Breakersite, is designed to help Glass wearers meet each other by alerting them when another Glass device is detected nearby. Users are shown a card on their Glass display of the other person's name along with his or her photo, and the idea is that the two people will then approach each other and become friends. Users can get "social points" by then snapping a picture of their new friend and sharing it with others on the Ice Breaker site. It's "the cool way to meet people," the Ice Breaker site declares. Ice Breaker describes itself as a "matching" service, but at the moment it pretty much just delivers alerts based on nearby Glass devices using GPS location data, its developers said. Their hope is that they can build up the service to incorporate more ways to determine matches, as the Glass product itself develops and gains more users. About 100 people have activated the app since it launched Wednesday at I/O, Ice Breaker developers said. Overall, Glass has been a bit of a mixed bag at I/O. Throngs of Google employees and multiple dozens of attendees can be found wearing Glass at the show, but no formal announcements on Glass were made during Google's marathon four-hour keynote on Wednesday. "Our main goal is to get happy users using Glass," Google CEO Larry Page said, when asked by a developer, during a surprise Q&A session, what the biggest areas of opportunity were for developing on Glass outside of what Google provides naturally. "The basic use cases around photography are amazing. Communications are amazing, navigation is amazing. Ultimately, a lot of your experiences can move to Glass," Page added. At last year's conference, a group of skydiving Glass-wearers landed on the roof of the conference center during the keynote address; there were no such theatrics this year. 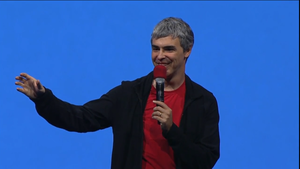 Google I/O ends Friday afternoon.